The two full-size tennis courts are located behind the clubhouse and have a combination lock. For the most recent lock combination, email or text. 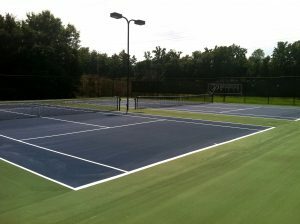 The tennis courts are solely for the use of fully paid PHCA homeowners. The light switches are on a timer. Please turn off the lights when finished and lock the combination lock. Residents are asked to be considerate of nearby neighbors. Keep noise levels down in the evenings. Please be sure to clean up all food and water containers. NO BIKE RIDING, SKATE BOARDING OR ANIMALS ALLOWED ON TENNIS COURTS.